120 grid-based logic puzzles in an easy-to read LARGE PRINT. For each puzzle in Puzzle Baron's Large Print Logic Puzzles, readers are given a background story and a list of text-based clues and are then asked to use logic to sift through the clues to arrive at the correct answer to a question. 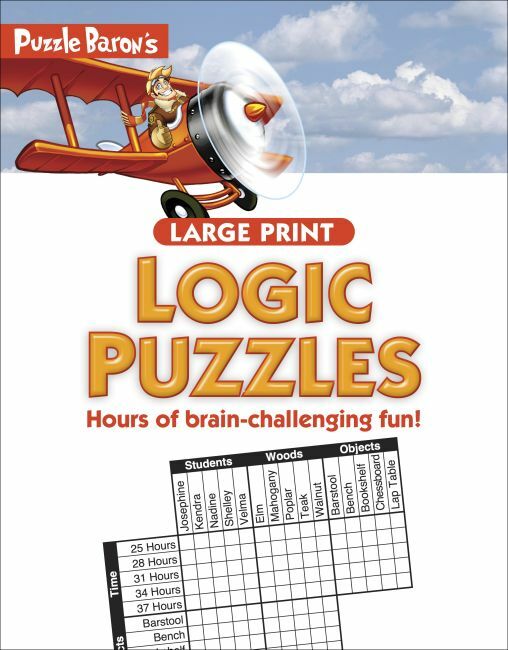 Unlike other logic puzzle books, every puzzle in Puzzle Baron's Large Print Logic Puzzles includes statistics-such as the average completion time, the record completion time, and the percentage of puzzlers who can complete the puzzle-to bring out the competitor in puzzlers and better inform them on how easy/difficult each puzzle is. Stephen P. Ryder is the founder and editor of the Puzzle Baron network of websites (PuzzleBaron.com). These sites focus primarily on textual games and puzzles, including acrostics, cryptograms, logic puzzles, drop quotes, sudoku, patchwords, and many more. The Puzzle Baron network serves more than six million visitors annually, along with an extremely dedicated user-base of more than 50,000 registered players who compete against each other for record scores and times. Stephen published his first complete puzzle book through Sterling Publishing in November of 2008, entitled Notable Quotable Cryptograms. His puzzles also regularly appear in the periodical Brain Games (Publications International) and other books by the same publisher.